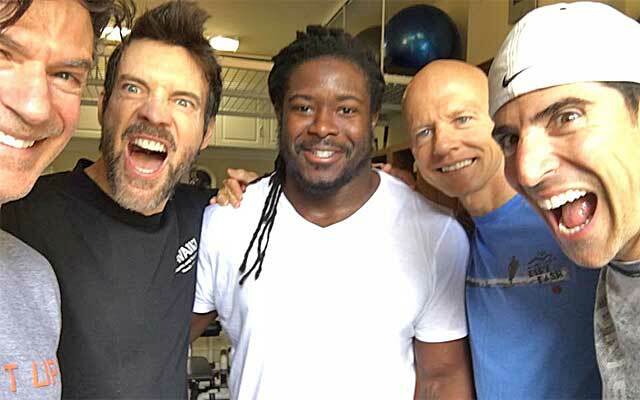 Eddie Lacy is skinny Eddie Lacy and he looks ripped. Eddie Lacy's body weight has been a whole thing ever since he entered the NFL. There were concerns about the way he looked in training camp, which was basically explained as "he's not photogenic." This was particularly true when Lacy blew up in 2014. Not so much in 2015, when he struggled badly for the Packers and got blasted by coach Mike McCarthy after the season for not being in shape. Lacy decided to take things seriously and started doing a P90X training regimen after creator Tony Horton offered up his program. Lacy consulted with Horton and apparently went to work because he just showed up in a picture on Facebook with Horton and some bros doing some SERIOUS WORKOUTS, BRO. But seriously, Lacy looks ripped in this picture. Crushing Shoulders and Arms P90X Style with T, Fifer, Scanga and new bud Eddie! !But enough about me, how was your workout? Now look. This is March. We're not even in the phase of the year where everyone is "in the best shape of their lives." But Lacy looks absolutely cut there. Losing weight and getting in better shape will just simply make him a better running back. Faster, more burst, can run longer, etc. There's a whole host of reasons. If he maintains this workout throughout the offseason and comes into Packers' training camp in good shape, there's no reason he can't have a big-time bounceback season in 2016.